MESA – District 18 Senate Republican Candidate Kevin Gibbons claims that he has the answers for our immigration policy problems. As an immigration attorney Mr. Gibbons has a credible claim to expertise in immigration law, but one look at his list of donors shows where his loyalties in immigration policy come from. While Gibbons says that he wants represent Mesa, only 20.6% of his donations come from people who live within the city. In fact, only 15.1% of his donations are from people in District 18. In contrast, 100% of Russell Pearce’s donors are from inside the district. More to the point, 53 of Gibbons’ donors are out-of-town farmers from Yuma and Buckeye, with over 30% of his total donations coming from Yuma alone. A large majority of these donations come from the farming community that is actively engaged in employing cheap labor which is against Arizona’s new employer sanctions laws. Since Mr. Gibbons would obviously better represent the views of his Yuma “constituents,” perhaps he should consider running for their senate seat. Kevin Gibbons supports initiatives that will weaken the laws requiring the use of E-Verify. He also advocates for a guest worker program that will basically open the borders for his farm and fast food supporters who desire cheap labor. 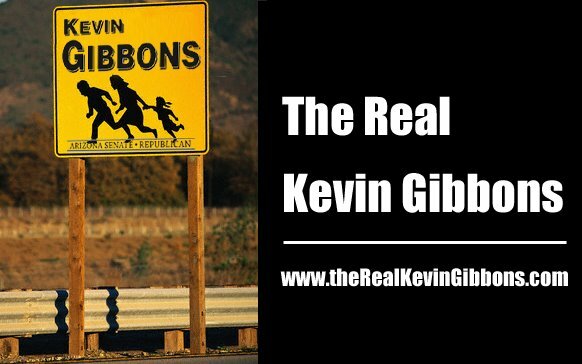 Kevin Gibbons’ policy positions are not the forward thinking policies supported by the citizens of District 18. On the contrary, they are the failed “business-as-usual” policies that do nothing to solve our immigration problems and promote the defiance of our laws. While Gibbons talks of “real reform” for illegal immigration, his supporters and backers tell a different story. From former Democratic Party Chairmen to Open Border Supporters, his rhetoric does not match the real intentions of his patrons. Russell Pearce has been a champion of the taxpayer and a nationally recognized leader on immigration issues. He has the conservative credentials and a solid track record of representing the people of District 18. Even a cursory examination of Mr. Gibbons’ list of out-of-town open border advocates and Democrat power brokers reveal who he would really represent. If Mr. Gibbons sincerely wants to represent the citizens of District 18, I suggest that he return donations he’s received from supporters whose policies we have clearly rejected.